If there’s one thing Madonna is known for it’s making a statement, especially when it comes to using her style and fashion to get the point across. The pop legend recently came up with a pretty creative way to send her message when she attended the GLAAD (Gay & Lesbian Alliance Against Defamation) Media Awards in New York decked out in full Boy Scout gear from head to toe. 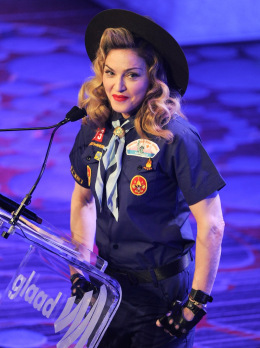 What do you think of Madonna’s latest fashion statement, using a Boy Scouts uniform to protest the ban of gay Scouts and Scout leaders? Do you think the Boy Scouts should rethink their ban?